Battery Powered Roofing Nailer | Our 2018 Choice! Technology has something better to offer to do the job better and faster, coil roofing nailers. A single hammer won’t be as efficient as using a framing or roofing nailer. These two types of nailers differ with the nails used. Framing nailers are used when driving long, small-headed nails using a collated stick, while a roofing nailer is used when driving shorter, large-headed nails from a coil. Nowadays, construction sites are utilizing the use of nailers for driving multiple nails during their workday. It is very important to have the best coil roofing nailer since you’ll be using it for working constructions or just doing your own project at home. You don’t have to look far and wide, we have a great coil roofing nailer here that is considered the best. Read on for our recommendation. This coil roofing nailer is lightweight and durable, an ideal tool for roofing as well as insulation board, fiber cement, and exterior drywall application. Bostitch had made an accurate and powerful; nail delivery tool that also gets the right depth for the job. It eliminates downtime with the high-capacity and quick loading magazine. What Did We Look At When Choosing The Best Coil Roofing Nailer? There are many brands of coil roofing nailers on the market. Just thinking about picking the best one among the crowd is intimidating enough. The reason why you’re here reading this is that you need help choosing the best among the rest and we are here to help. After you’ve read through the end of this, we assure you that you are set to have the best coil roofing nailer. So to start, here are several of the core features you should seriously consider when choosing a nailer. Roofing jobs are usually done all day and it requires working with heavy materials. Given this situation, a roofing nailer should be lightweight as possible to reduce fatigue. Even pros will agree that one of the first things they consider when buying a nailer is the weight. Some brands are lighter than others thus it is important to carefully compare. The nailer should not only be light but reasonably balanced from head to handle. A 5-pound roofing nailer with a heavier nose gun will feel heavier compared to a 5.8-pound nailer with a balanced weight. A good weight distribution will make the gun lighter than it actually is. Some think that it’s no big deal but once you start using a hastily bought nailer with unbalanced weight, it can be a bit of a problem. For example, a nose-heavy roofing nailer puts extra strain on your wrist and arm. It might be a small thing and might go unnoticed for a while but over time it can create serious injuries. The repetitive nature of pulling the trigger can cause sore fingers, especially in single action mode nailers. To avoid this, one should pick a large trigger (enough for two fingers to fit) with a smooth and contoured shape. A rubberized pad is also a great addition for comfort. Another thing to consider is the trigger action. It should be light and easy to touch otherwise it’ll be tiring to hold the trigger with high spring tension. Since you’ll be working all day with the nailer in your hand, it’ll be great to have a comfortable grip. The roofing nailer’s handle should have an over-mold grip for an easy and comfortable hold. A good nail gun has mechanisms that allow you to set up the depth of drive. This feature is handy when you are working with the same compressor. The pressure that is good for one gun might cause another to over or underdrive nails resulting in major problems. To avoid this from occurring, adjust the depth of drive by a simple turning of the thumb wheel on the nose or near the trigger will help. Some nailers are equipped with anti-dry-firing, a feature that prevents a nailer from firing when it had run out of nails to drive. Manufacturers had decided to include this nice feature to lessen unnecessary wear and tear on the device. It also signals the users to prevent them from thinking they are driving when they only fired a blast of air. A nailer has two firing modes, contact trip, and sequential trip. The former drives nails when both the trip and the trigger are depressed at the same time. Many contractors prefer this because it rapidly drives nails just by bumping it against the surface but it also poses safety risks. It is often described as a firearm and needs more careful handling. On the other hand, the sequential trip will drive a nail after depressing the trip against the surface and pulling the trigger. The process is easy, accurate, and safer than the contact trip. Many nailers come with both firing modes. We recommend you to keep the sequential trip no matter what. The best roofing nailer allows you to load the gun quickly and easily. And to be the best nailer, the basket and magazine should have this ability. The magazine capacity is also important. It’ll allow you to work for long hours without constantly stopping to reload nails. A few models also have a single cover for the magazine and the feed. It saves time with fewer pieces to manipulate. When you drive nails, a sudden burst of air often accompanies it. An exhaust vent deflects this and prevents users from the annoying bursts of air. A properly maintained device will seldom jam but there are times when it’s unavoidable. There are steps to how to clear a jammed nail gun but it takes up a lot of working time and requires safety precautions. Having a nail gun that has a jam release latch is ideal to avoid this. A nifty lever allows you to clear the jams quickly and easily without breaking a sweat. A quick-connect swivel connector helps prevent hose tangles. Many pneumatic nailers have a swivel air connection that allows for easier handling of the hose during movement. It’ll be great to have a roofing nailer with a shingle guide. It is like a jig that makes sure the shingle is in the right position before nailing. A tool-free shingle guide also helps in the precise spacing of the shingles. Pneumatic or cordless? One of the first question you should ask yourself before deciding on any nailer gun. Pneumatic nailers use compressed air usually generated from a gas-powered compressed to drive the nails. It can drive large nails on hard surfaces with ease. 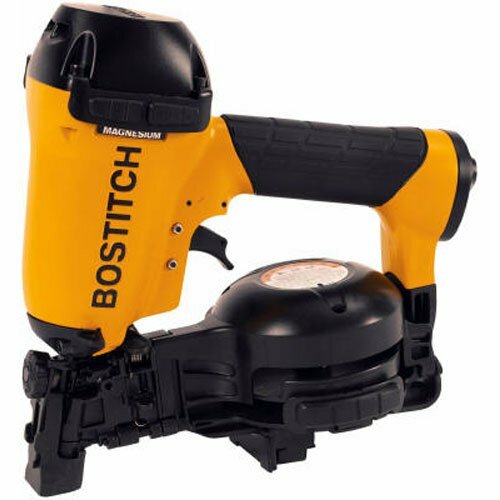 Cordless nailers rely on a power supply to hammer the nails.Most roofing nailers have the pneumatic operation but there are others which are cordless. Cordless nailers are ideal for smaller jobs since it’s a bit heavier. Pneumatic nailers are powerful since they are powered by air compressors but they also require more close attention. What is your pick? With all these features, they will do no good if the device is not maintained properly. Proper maintenance means that the coil roofing nailer needs to be oiled daily. And you should check your manufacturer’s instructions for the proper care of your coil roofing nailer.